Climate change is increasingly recognised as a major challenge. It is widely accepted that the greenhouse gas emissions caused by humans are having a negative impact on the environment. The most important greenhouse gas, arising from human activity, is carbon dioxide (CO2). Virtually all human activities cause the CO2 emissions that lead to climate change. By using electricity generated from fossil fuel power stations, burning gas for heating or driving a petrol or diesel car, every person is responsible for CO2 emissions. Furthermore every product or service that humans consume indirectly creates CO2 emissions; energy is required for their production, transport and disposal. These products and services may also cause emissions of other greenhouse gases. Understanding and addressing the full range of our impact is crucial for the effects of climate change to be minimised. The total set of greenhouse gas emissions caused directly and indirectly by an individual, organisation, event or product is commonly called their carbon footprint. Establishing the carbon footprint of an organisation can be the first step in a programme to reduce the emissions it causes. Virtually all human activities cause the CO2 emissions that lead to climate change. Most commonly, direct emissions will result from combustion of fuels which produce CO2 emissions, for example the gas used to provide hot water for the workspace. In addition, some organisations will directly emit other greenhouse gases. For example, the manufacture of some chemicals produces methane (CH4) and the use of fertiliser leads to nitrous oxide (N2O) emissions. Workplaces generally use electricity for lighting and equipment. Electricity generation comes from a range of sources, including nuclear and renewables. However, in the UK around 75% is produced through the combustion of fossil fuels. Although the organisation is not directly in control of the emissions, by purchasing the electricity it is indirectly responsible for the release of CO2. 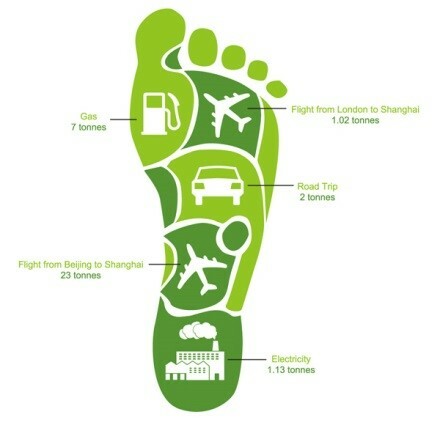 Carbon footprints are typically calculated to include all greenhouse gases and are expressed in tonnes of CO2 equivalent (tCO2e). However, others calculate the footprint to include CO2 only and express the footprint in tCO2 (tonnes of CO2). The reasons for needing a carbon footprint will determine which approach is the most appropriate. To ascertain what level of emissions they need to offset in order to become ‘carbon neutral’.